Mom, the Intern: Birthing stuff. This picture never gets old to me. A little while back, I talked about all the ways I've attempted to make this pregnancy easier and a little more enjoyable than my last two. So far, it's all been working well for me. I also wrote about our struggle with naming this little girl. I appreciate all the name suggestions and we are currently analyzing them to death and trying to choose one. We may just need to wait until she is born to make any final decisions. But as you may have noticed, I still haven't publicly broached the subject of childbirth yet. Not on this blog, anyway. I've had mixed feelings about how to approach the topic since it is very personal and also hotly debated. Especially online where people tend to abandon all civility. However, I am also a believer in the power of discussion. I can do all the research I want on any given topic, but often I need to hear an anecdotal point of view or 10 before I feel comfortable making a decision. So, I'm opening up the floodgates. I'm talking about childbirth. If you are familiar with my blog, you know that I've experienced two less-than-desirable birth processes. Yes, both births ended in healthy babies, and for that, I could not be more grateful. But things didn't go so well for me, good ol' Mom. This is the part that we as a society never talk about -- how does the mother fare in the aftermath of childbirth? Audrey's delivery ended in a C-section and Carson's, a vacuum-assisted vaginal birth that injured me severely. Again, I was and still am grateful for the medical advances that allowed my children to be born healthy and alive when they otherwise wouldn't have. I am grateful for the doctors who made smart decisions in the heat of danger. And even though they were both terrible births, I would do them each 100 times over if it meant saving my children. Any mother would. But here's the thing -- I know deep down it doesn't have to be this way. I don't have to have my innards cut in half and I don't have to spend six months wondering if I'll ever be able to be intimate with my husband again. There are other options for people like me. When I got pregnant with this baby, I knew from the start I would want to see a certified nurse midwife for my obstetric care. CNM's are licensed to do all that regular OB's do, minus the ability to perform surgery. They are trained in both nursing and midwifery and they often deliver in a hospital setting like an OB. I had read that they take a more natural approach to prenatal care, labor and delivery and serve as an advocate for birthing mothers. They take time with the mothers, addressing all their concerns and validating each one. Based on my previous scary birth experiences, I knew I would want to deliver in a hospital no matter what. But I also wanted a provider who would help minimize the possibility of a repeat C-section as well as any injury I might sustain during a vaginal delivery. And after all I'd been through, I wanted someone who would care. So a CNM seemed like the best route to take. Having experienced both health care providers now, I can attest there is a huge difference in their approach. Midwifes tend to focus more on the mother and baby's care by spending more time with you during appointments. They don't rush into the room, peek at your chart, check for heart tones and then leave you in a swirl of unanswered questions. A traditional OB appointment may last 5 - 10 minutes while a midwife appointment lasts between 20 - 30. You leave feeling empowered and excited for what is to come. Now, I don't mean to discredit obstetricians. Many of them are abandoning the old school hit-and-run approach and are devoting more time to the patient's routine care. I recently saw the OB over my midwives' practice and I found he took just as much time with me as the midwives do. He was warm, kind and knew my chart backwards and forwards before he even came in the room. He addressed me by name repeatedly and talked with me on a personal level during the appointment. The best part was when he explained his birth philosophy, which is that childbirth should be a family experience, not a medical one. He understands that sometimes medical interventions are necessary to get baby into the world safely, but he believes those instances can be largely avoided through proper care and limiting interventions. So, I basically love him. Does seeing a midwife mean I have to deliver without an epidural? No. That's the best part about midwives -- they are your advocates. They aren't supposed to push their ideals onto you during a very personal, intimate family experience. They are there to support you in whatever you decide and facilitate the birth of your child. What will I do for pain management, then? Well (and this is the part I'm nervous about discussing) ... I want to go unmedicated this time. Don't get me wrong -- I LOVE epidurals. I have had two of them now. I am not trying to be a hero or prove a point or anything like that. But my experience has been this: when I had an epidural, I couldn't feel much of anything. I couldn't feel when to push and when to stop. I didn't have full control over my lower body muscles so I had to rely on the direction of doctors and nurses when it came to pushing baby out. And the vacuum didn't help, either. Some people don't want to feel any of that pain, and guess what? I'm one of those people. I really don't want to experience the agony of childbirth if I don't have to. But ... I need to. Why? Because I would rather have hours or even days of birth pains than months and years of not being able to use the bathroom normally, hemmorhoids, vaginal pain, prolapse and sexual abstinence. Yeah, that was the reality for me after my second child's birth. I'm not irrationally scared of what could possibly happen -- I'm scared of what HAS ALREADY happened to me. I am more scared of the aftermath than I am of the pain I will definitely experience during baby's birth. I just cannot do that again. So why not just see a regular OB and refuse an epidural, then? Well, a midwife is going to be there when I show up to the hospital and remain by my side (or leave it if I want her to) until the very end. She will encourage me to use a birthing ball and walk around during labor. She will talk me through the pain. And when it comes time to push, she'll let my body work and won't force me to bear down prematurely which will minimize tearing and the need for an episiotomy. In essence, she'll provide me with an environment in which my goal for a safe, non-injurious birth can be realized. Today, I am 90 days away from my due date. I have to start thinking about how I'm going to get through this without the beautiful epidural. I am most interested in hypnobirthing but I'm open to other suggestions. That's why I'm blogging about this -- I need your help. (I tend to need your help a lot these days, huh?) What methods have worked for you? Or, maybe you haven't tried to give birth without medication, but you know about methods that worked for your loved ones and friends. Lay 'em on me because I need all the help I can get. Ina Mays book. Incredible. I decided at 34.weeks i wanted a natural birth. I was late in the game. Haha. I just did the techniques and read the stories in Inas book and that was it. I will lend you my book if you'd like! I know what you mean about wanting to go natural thing time. My epidural with Zoey was too strong, and I don't remember much about delivery, because of the fog I was in. My epidural FAILED with Camden as soon as I got to 7cm. The anesthesiologist topped it off, but it went everywhere EXCEPT for what I would've liked to have numbed. My arms, face, and legs were numb, but I felt every contraction and every push until he was born. I decided that with Cora, I was going natural. I didn't want to be too drugged, I didn't want to lay in a bed all day or night, and I didn't want to chance another failed epidural. Tyson (my husband) kept telling me to just get one, and that my window for getting one was getting smaller and smaller. It was pretty irritating. I ended up sticking with my plan. I was able to soak in the jet tub for relief, walk the halls, sit on the ball, go to the bathroom without a catheter, (yay) and even take a shower. Don't get me wrong, natural child birth is extremely intense and hurts like every bad word in the book. But I'd do it again in a heartbeat if it meant I didn't have to chance another failed epi. So good luck to you, Jenna. You described my recovery (minus the vacuum and prolapse) with Benedict. It SUCKED. I didn't realize how hard it would be on my marriage for my lady parts to not be functioning. There was always so much pain. My next delivery is going to be very different!! Suggestions though: Ina May's Guide to Childbirth (lots of awesome birth stories, some hippie ones too, but then some scientific stuff to back up her thoughts), Baby Catcher by Peggy Vincent (modern midwife stuff), and Birthing from Within by Pam England (childbirth prep and other happy things). I haven't read the last two, but everyone who has used them LOVES them. Also, have you thought about a doula? I have two friends who went natural and RAVED about their doula. Look into it. Check out Yelp and online mom boards for reviews. It's not as costly as it seems (400 bucks or so? it might be cheaper than an epidural!) and they are awesome about being your advocate and helping out where your husband is clueless :) Bottom line: you don't have to do it on your own. And mostly, it's going to be ok. You are a strong woman. You have done hard things! Like graduated from college even while being pregnant and having a baby! You'll be great. Oh! And I heard this book is great too, I can't wait to read it. It's called The Gift of Giving Life: Rediscovering the Divine Nature of Pregnancy and Birth it's by LDS authors. I've heard it's so empowering and just a great look at a religious stand point of motherhood, birth, and pregnancy. And since you're doing natural in a hospital, I've had people recommend Natural Hospital Birth: The Best of Both Worlds. I have had three pregnancies and on my last one just 8 months ago, I gave birth to a 10 lb 7 oz. baby girl vagianally and without medication. I used Hypnobirthing. I am so grateful I did that. If you are interested in that, go buy the book and start reading. It is Hypnobirthing: The Mongan Method. One of the things that helped me the most was, in my class I took, the teacher helped me to find relaxation. And the more you practiced, the faster you could relax and the deeper you could go. I'm not saying my mind was in a different place, but during my contractions, I relaxed and let my body do what it needed to do. I was only at the hospital for two hours before I had her and it certainly is a feeling that's hard to describe, but I would do that again. I decided it's not as horrible as most people say. At least it wasn't for me. I also had a few rules because my mom and my husband's mom would be there with us. They were not allowed to talk about their experiences or say "pain" or "painful". I used the words "discomfort" or "uncomfortable". It really helps. Keep positive and start right now imagining the perfect birth. I truly believe if you focus on the positive it can happen that way. Sorry if this is way too over the top. All my thoughts just came pouring out. I had both my babies naturally and it was great. I had my first one in the hospital and my second one at home (2.5hr labor!!) I think natural birthing is the way to go. Try to push slowly and I think that will solve the hemorrhoid issue. I had hemorrhoids after my second child for a couple weeks and it was not fun. I think it was because I pushed him out SO fast and I pushed really hard. My midwife kept telling me to slow down, but I felt like I couldn't. What office are you attending and which midwife have you been seeing? I went to Valley Women for Women and LOVED it. I had my first baby with an epidural and my second without. I plan on doing this one without as well. For me, the difference was felt in 2 ways. First, my recovery time was so much shorter. I felt like I could walk around almost immediately after McKay was born. I also had an extreme amount of endorphins which made me feel on top of the world. Secondly, I was so proud of myself I could hardly stand it. I DID IT! It was just a reminder that I can do hard things. 1. The "Hyponobirthing: the Mongan Method" and the class I took felt hokey and over idealistic. They tried to say that child birth shouldn't hurt if you do it right. I am calling B.S. on that. The most important thing it did teach me was to visualize. This is what got me through the pain. I closed my eyes and pictured my other children over and over again. Also, if you have ever endured a physical contest (run a marathon) or something like that, picture that and the pride you felt when you where done. I also came up with a mantra, or chant, that I could repeat in my head over and over again. Something meaningful and encouraging. 2. Spend as long as you can handle at home. If you are not going to get an epidural, the hospital isn't going to offer you too many more comforts than your home. As soon as you get to the hospital, you will be tempted to get an epidural because you can. 3. Hot tub in the hospital room. Best.thing.ever. Get in there and don't get out until they make you. 4. Every woman is different and every labor is different, so this next part needs to be taken with a grain of salt. 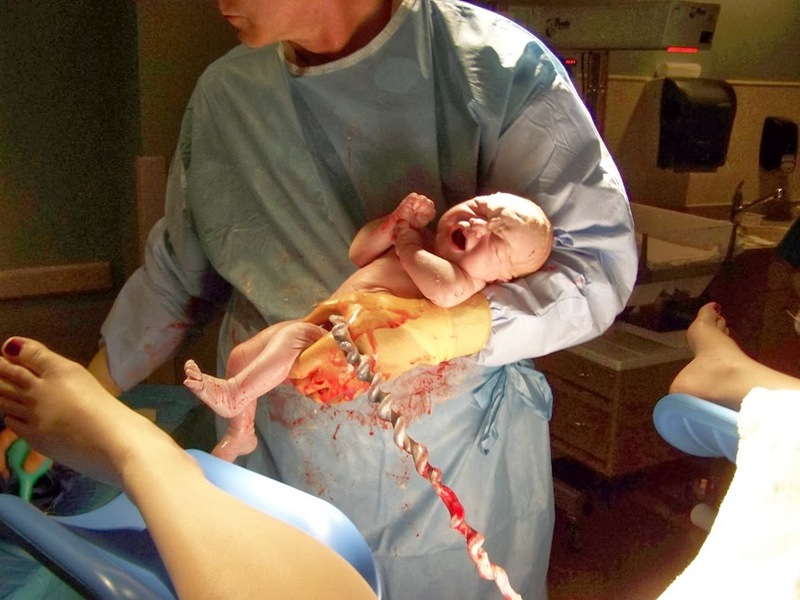 When I thought of natural childbirth, I imagined 16 hours of intense pain, because this was how long my first labor was. I thought there was no way I could hold on for that long. For me though, the only REALLY painful part was transition (which for a 3rd time labor averages less than an hour and a half). You can do anything for that long, and it could be way shorter than that. Now here is the brutally honest part. I wanted to shoot myself in the face when it came time to push and during the pushing. I actually truly wanted to die. Just sayin'.But, the encouraging thing is that a lack of epidural will make your push time much less. 5. If Dillon is on board, it will make it soooo much easier. The Bradley method worked well for us. There is a modified version that doesn't teach that episiotomies.are good. I had my baby girl in September and was able to go without medications - and I think what worked best for me was my stubborn determination. I knew how badly I wanted my experience to be natural and I held onto that desire and reminded myself of all the reasons why I wanted it that way. Like you said, that brevity of pain is worth it if we hold onto it and remember why we are doing what we are doing. Just focus on your end goal and that commitment will help you through it! I also recommend "Ina May's Guide to Childbirth." That book is so empowering! And with this pregnancy (41 weeks today.. hoping this kid comes out soon!) I bought the Hypnobabies Home-Study course and it has helped SO much with mentally preparing me. I highly recommend it! There is a birthing book you can get from the qc library. I'll have to find the title of it but I know the midwives at Valley Women for Women recommend it. The lady favorites it is eccentric but I think some of the out of the box tools she uses could help with your anxiety. I read 4 different birthing books and although this one was defiantly odd/hippyish (even by my family's standing) I think it was the most helpful, although the hypnobirth book was second. My birthing experience was an awesomely easy one by accident. I had an epidural, but because it was Thanksgiving and they were short staffed and because I was a "first time mom who would take forever" they didn't check on me much. I kept feeling like I had a lot of pressure down there, but was told I'd be fine. By the time they finally checked me, they could see his hair and told me to please try to hold it while they contacted the doctor at his family Thanksgiving dinner. By the time he came I pushed 2-3 times and he was out. No ripping, no episoitomy (sp?) and great healing afterwards. In fact, my doctor said at my 6 week appointment that it looked like I had never had a baby (down there). My goal forever and always: cease and desist. I am too big a baby to not have pain, but I refuse to start pushing just because I'm at a ten. It was so fab to have my body work the baby down (although I'd like to make sure everything is fine and not be left so alone). It wasn't strenuous or exhausting and it was so easy and painless. I agree with letting your body work and not bearing down because it's time for the doctor to go home. Best of luck deciding. I hope whatever you chose that this third one will be your best delivery yet. Keep us posted!! this is megan lavin by the way :) --sorry, logged into the wrong account. I had epidurals with all three of my babies (which was definitely the plan! ), but with #3 I knew I wanted to hold it off as long as possible. I used this book: http://amzn.to/1b3gj5q . I liked it because it seemed less "intense" than other methods, and allowed for flexibility, which is great since we all know these birth things never quite go according to plan. :) I used the most basic pain management technique they talked about and I truly think it made a world of difference. Also, let me just say that I really admire you for (a) being so open and honest about your past struggles and (b) being proactive about this whole thing! It takes courage to do what you're doing and not just consign yourself to more postpartum misery. I really, really hope it all works out for you! My first birth experience; wanted a natural birth ended up with Pitocin and an Epidural....bummer! No tearing or vacuum though. Second birth experience: Changed to a midwife, labored at home for most of it. Went in to the hospital and 3 hours later had him. I did tear but no vacuum . The midwife did need to help pull his shoulders through with her hand. I just think it was because he was 10lbs. I think when anyone puts their mind to it they can do anything. I also read into the Hypnobirthing and some if sounded like something I could do. In the moment though I forgot all I read and just did it. I believe the Midwives do help a lot with sticking to your plan and helping you through it. The only thing that I wished would have happened was that when I was pushing out his head I told her I felt like I was going to tear and asked her if she could stretch me out more. She said I looked fine and didn't do as I asked and ended up tearing so that was a bummer. I hope all goes all according to what you want though. You can do it! I say this now but it wasn't that bad and I got a beautiful baby out if the situation. You just forget all the pain when you hold 'em for the first time! Good luck! Hypnobirthing provides a great new way to approach childbirth. However, I found Hypnobabies more comprehensive. It just provided more practical tools for every situation. I'm also really lucky that the hospital nearest me actually allows rental birthing tubs to be used, and they typically don't make you get out until a few minutes after the baby is born. They've become so popular there that the nurses call them "aquadural tubs". I'd definitely check out hospital policies about how much freedom they give you to be where is most comfortable. I think the tub and the birthing ball provide the best environment to allow yourself to utilize the hypnotherapy tools you choose. I think you have done a great job with trying to find a good solution for you. I have had pretty horrific child birth stories- including my last delivery when after baby A was out, epidural wore off and baby B decided to flip and his heart stopped. They had to do an emergency unmediated c-section. It was enough for us to call this whole baby thing quits. I donno, after having an emergency c-section without medication, and your experience of needing an emergency c-section it would terrify me if you didn't at least get an epidural. Unmedicated c-sections are not fun... very traumatizing. Birthing is a rough business. My SIL also hated the 'I can't feel anything' with an epidural with her #1. With her babies #2 and #3, she just asked for a light amount of epidural and it blocked the majority of the pain, but she could totally feel when she needed to push and felt the birthing. Maybe see if that might be an option. I don't think I have ever commented on this blog. Love it! Thanks for all your work. With that, I feel a midwife you trust is CRUCIAL to having a successful natural birth. Because as you said they are with you the whole time supporting you in the natural process.. I had OB's with my first two children, and a year ago had a midwife with my third, and the whole birth experience was so much better, and completely unmedicated. I even gave birth in a hospital, and labored in their tub for much of it, which you should look into seeing if your hospital has one, because water helps a ton in relaxing during labor. They wouldn't let me deliver in the water, but when it came time for delivery they just drained the tub and let me deliver on my hands and knees. I also did a prenatal yoga youtube video that was like 20 minutes long once a week that helped me learn to breath and relax my body so when labor came I was much more prepared and able to relax more. With that said, I still don't love natural birth, but the recovery was SOOO much better for this one, and my labors are so fast I don't always have the option of a medically assisted birth so it was worth it for me. Good luck! I hope your experience is great! Let me tell you, now that I've done it unmedicated by choice, followed by an epidural again, I realize how much I prefer being unmedicated. For me, I feel pain either way. Unmedicated, I feel the pain before and am much better off after the baby is out. Drugged, I am better off before, but get the full force of pain once I am left to care for a newborn. For your sake, I hope that this delivery goes exactly how you plan (and that you've been doing relaxation or birthing classes to prepare)! If it doesn't, know that we are all supporting and loving you, whether the unmedicated delivery works out as hoped or not. Be strong, you can do this! !